Right after we purchased our Island Packet 350 in February 1998 I decided that we needed to install a dedicated 110 volt Inverter so that we could power the Microwave Oven and any other 110VAC devices that we would put on board in the future. 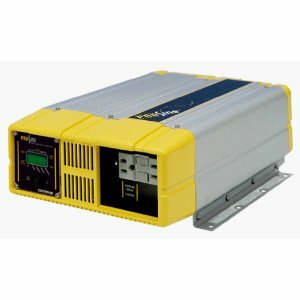 I subscribed to the old Sailnet email discussion group and learned that Blaine (IP-40 Charbonneau) had a Xantrex 1800 watt pure sine wave Inverter for sale at a very good price. The Inverter had been installed by accident on his boat and he was having it removed and replaced. I bought the Inverter and installed it under the upper/aft port salon shelf. I originally wired the Inverter so that just the hot (black) wire was switched at the AC Main breaker panel and this worked fine until 2007. In 2007 we stopped at the Rodney Bay Marina (St. Lucia) for a few days on our way South to Grenada. The newly renovated marina had state of the art power pedestals and the shore mains tripped every time I switched our power on, even with no loads connected. I took a look at the boat AC diagram and thought that the problem might be the Inverter neutral and some current leakage between the neutral and ground connection. I removed the neutral wire from the Inverter, tried the shore power again and all was fine. 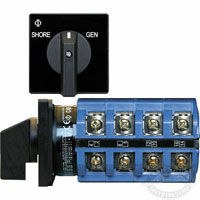 I purchased a Blue Sea Source Selector Switch, Model 9009. Installation was straight forward and since both the hot and neutral lines are switched there were no more problems tripping shore power pedestal breakers. The switch is used to select either shore power or Inverter power.